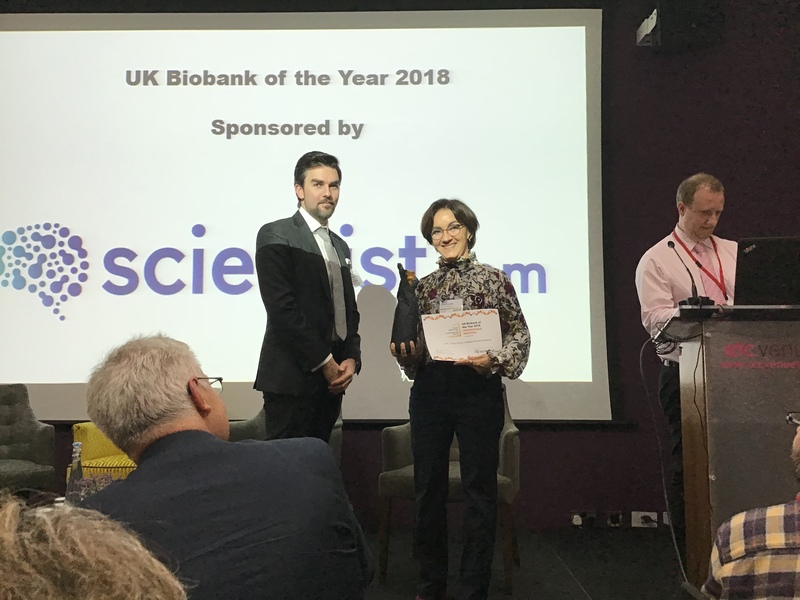 The Avon Longitudinal Study of Parents and Children (ALSPAC) have been awarded UK Biobank of the year 2018! Now in its 3rd year, the awards were presented at UK Biobanking Showcase on the 27th November in London. The Cure ME Biobank were given an honourable mention as runner up. ALSAPC began in 1991, recruiting pregnant woman in the Bristol area and following them, their children and partners ever since. Since the start of the study 1800 scientific papers have been published using data gathered from ALSPAC, over half using data generated from samples in the biobank. Of the award Head of Laboratories Susan Ring said “Children of the 90s is a truly unique resource leading to a huge range of improvements to our health and wellbeing. The award recognises the quality of our samples and the worldwide research it enables. Biobanks can struggle to get recognised for their contribution to the research process. The award is intended to recognise this invaluable contribution. UK Biobanks could nominate themselves by submitting two research case studies detailing how their work has enabled high impact research. The panel of judges merited nominees based on the impact of the research and the role of the resource in the research. Other factors such as the engagement the resource has with external stakeholders was also assessed. One of ALSPACs case studies was about levels of iodine during pregnancy influencing children’s IQ and reading ability. Matthew McLoughlin presented the award to ALSPAC, on behalf of Scientist.com, who were sponsoring this year’s award. The Cure ME Biobank, which is based at LSHTM, was awarded an honorable mention by the panel. This resource has only been running since 2011 but has shown significant research value and excellent patient engagement with the community. ALSPAC now join a small club of three previous winners including Ethical Tissue (2016) and Bloodwise Childhood Leukeamia Cell Bank (2017). Anne Thomson attended the event on behalf of CLCB, last year’s winners and outlined what the award had meant to them. If you’re keen to join the club keep your eyes open for the applications to open next year! Find out more about ALSPAC on their UKCRC Tissue Directory profile. Find out more about The CureME Biobank on their UKCRC Tissue Directory profile. 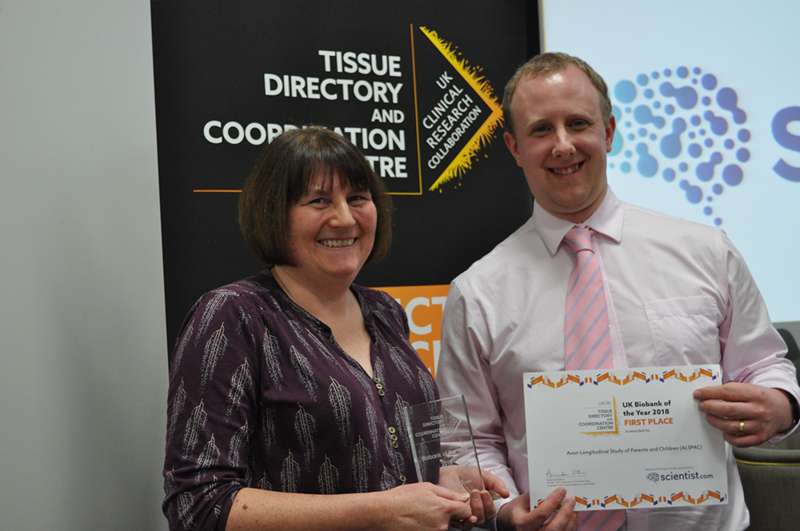 The UK Biobank of the year award is presented at UK Biobanking Showcase, the annual meeting of the UKCRC Tissue Directory and Coordination Centre. Find out more about the previous awards in 2017 and 2016. This entry was posted in News and tagged ALSPAC, showcase, UK Biobank Award. Bookmark the permalink.